CAMBRIDGE — The American Repertory Theater (A.R.T.) 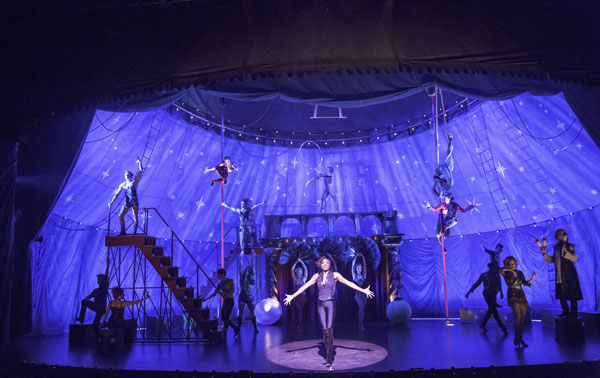 at Harvard University is pleased to announce that its run-away hit musical “Pippin” has received 10 Tony Award Nominations. This news comes alongside several other announcements including 6 Drama Desk Awards nominations, 11 Outer Critics Circle Award nominations, 3 Drama League Award nominations, and 2 Elliot Norton Award nominations. This production of “Pippin” was directed by A.R.T. Artistic Director Diane Paulus, and was first presented as part of the A.R.T.’s 2012/13 Season. After a sold-out run in Cambridge, the show moved to Broadway’s Music Box Theatre for its first turn on The Great White Way since the original production premiered in 1972. This revival has received critical acclaim for its unique and inspired combination of circus movement by Gypsy Snider and choreography by Chet Walker in the style of Bob Fosse. Set design is by Tony Award-winning designer Scott Pask, costume design by Dominique Lemieux, lighting design by Tony Award-winning designer Kenneth Posner, and sound design by Jonathan Deans and GarthHelm. Orchestration is by Tony Award-winner Larry Hochman, Music Supervision by Nadia Di Giallonardo, and the Music Director is Charlie Alterman. The Elliot Norton Award nominations are: Outstanding Musical Production by a Large Theater, and Outstanding Musical Performance by an Actress – Andrea Martin.